Volkswagen's only SUV offering for India has been the Touareg. Two generations of the full size SUV was available in the country. Apart from a brand building exercise it didn't make sense for Volkswagen to offer the vehicle in our country. That's because we are obsessed with compact and more affordable SUVs. In fact it made more sense for Volkswagen to roll out an SUV like the Tiguan. It's a very successful SUV too, 2.8 million Tiguans have been sold in about 170 counties so far. It may not be the most stylish SUV in its class but the footprint makes it ideal to drive in a country like ours. However, in hindsight it may have been a good decision by Volkswagen not to introduce the Tiguan in India. That's because the all-new Tiguan has just rolled out in Europe and it promises to be an improvement over its predecessor in every way possible. We did drive the Tiguan early this year. However, the drive was more on ice. This time around, we flew to Berlin and drove the promising new SUV around Berlin for a more real world drive experience. The new Tiguan is larger than its predecessor and looks a lot more stylish when viewed from any angle. The wide front end reminds one of the new Passat but also gets a strong SUV character. The hood gets a lot of detailing in the form of character lines that are quite prominent. The imposing grille is finished in chrome and the upper line blends well with the headlights. A mock air dam like the Polo WRC and silver detailing make the bumper look a lot more aggressive. The Tiguan is larger than before, the previous one was based on the smaller Golf but the new version is based on the MQB platform. It is also the first Volkswagen SUV to use this new vehicle architecture. The sides are smart and simple too. The wheelbase is longer this time and the overhangs are short too. Wheel arch and side cladding goes well with the Tiguan's character. Move to the rear and you'll notice that the design goes well with the rest of the car. The angular LED lamps feature lot of detail while the bumper gets a contrasting diffuser like insert. Overall, the Tiguan's styling is very appealing and will turn heads in India. It's the same case with the interior too. The newer Volkswagen cabins are a lot more stylish and the Tiguan takes it to a higher level. The dashboard is angled more towards the driver. There are two interior colour options, we preferred the all-black interior to the beige. The centre console is a lot more angular and uses buttons that feel built to last. 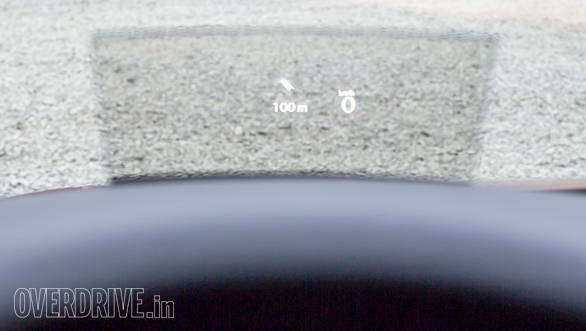 The large centre screen offers various infotainment features and like the Skoda Superb, gets smartphone connectivity as well. The steering wheel is flat bottomed and more like the one seen in the updated Polo. 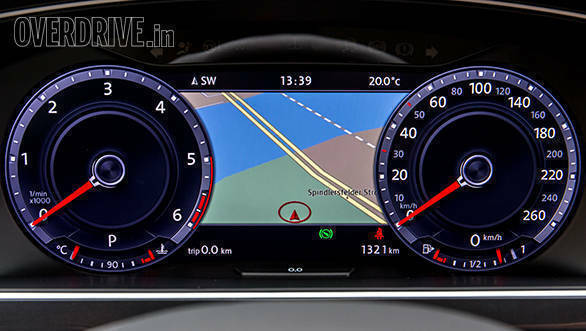 An all digital instrument cluster is similar to the unit seen in the new Passat. It offers a lot of information and can be customised too. Driving position is more car like and the view, more SUV. Quality of materials used and overall fit is impressive. Rear seats are wide enough to accommodate three adults. The middle passenger will however have to deal with the higher transmission tunnel and lower rear AC vents. Rear knee room has increased by 29mm. It is sufficient and comparable to C-segment sedans. The rear seats also fold flat and slide, ideal for added storage space. 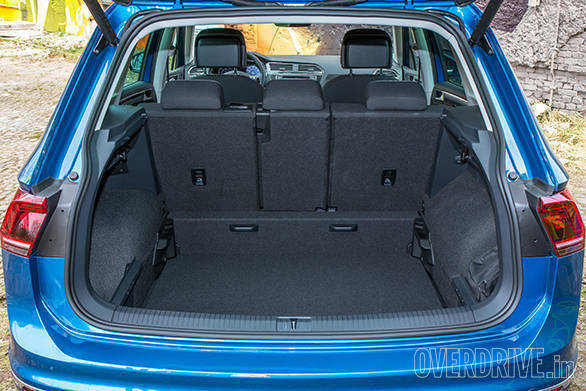 Boot space varies from 520  615 litres depending on the rear seat position. The Tiguan is offered in both petrol and diesel engine options with various power ratings. We decided to drive the 2.0 TDI model producing 150PS and 340Nm of torque. This is the variant that will most likely make it to India. 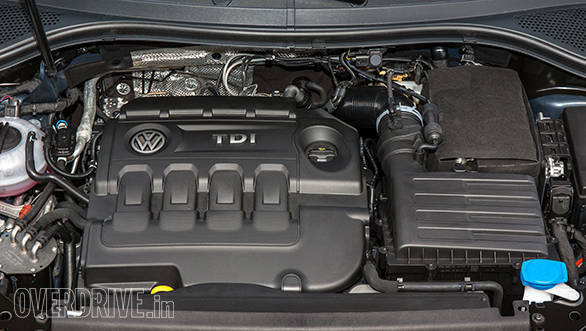 The engine is based on the same family of engines offered in various Volkswagen group cars sold in India. It is a lot more refined and is claimed to be more fuel-efficient. Power delivery is smooth and linear while gear shifts from the 7-speed dual-clutch transmission are seamless. It's perfect to drive around in town as well on the highway. The NVH levels is impressive too, the cabin felt better insulated than most premium Volkswagen cars we've driven before. Getting to triple digit speeds is quick and cruising at similar speeds is effortless. The Tiguan displays good dynamics and rides well too. The MQB architecture and larger dimensions has reduced the overall weight despite the addition of various safety and electronic systems. The wide track and well tuned suspension makes it a pleasure to drive around fast corners while straight line stability is on par with competition. 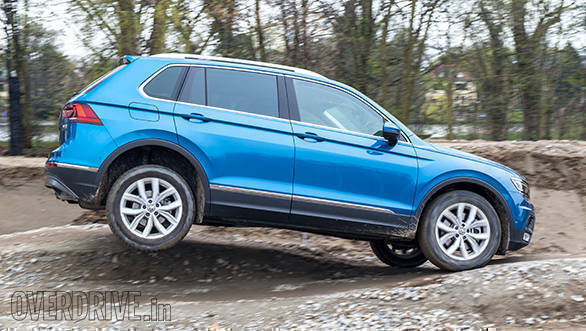 We drove the front-wheel drive Tiguan, expect even better grip from the all-wheel drive variant. The ride feels stiff on broken patches. Expect the suspension however to be better tuned for Indian road conditions when it makes it to our market. 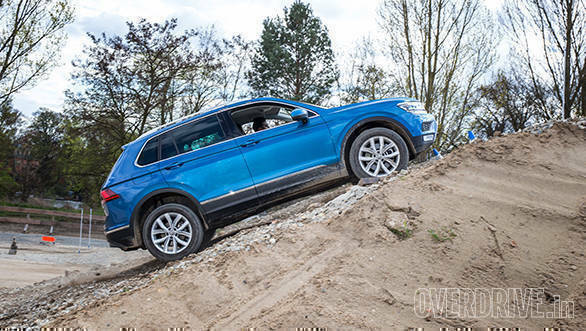 We got behind the wheel of the Tiguan 4MOTION all-wheel drive and tested it on a specially created off-road course. The course was designed to highlight the features of the SUV. While we aren't sure if this variant will make it to India, it is quite a capable soft-roader especially when compared to rivals like the Audi Q3. 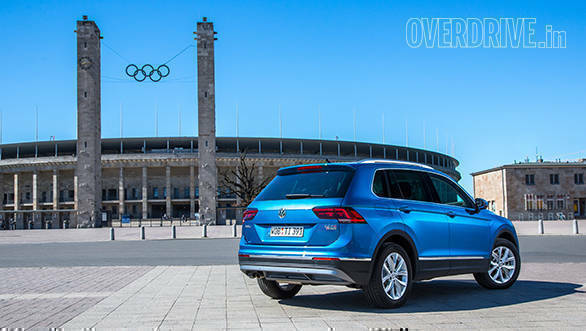 In fact the next generation Q3 will use the same platform and technologies used in the Tiguan. It gets a fifth generation Haldex coupling that distributes torque to the two front wheels or all four wheels depending on usage. 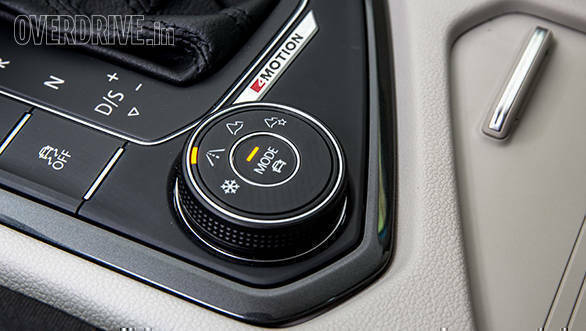 A rotary button placed in the centre console can be used to choose between various on and off-road modes. The various profiles are specially tuned for driving off-road and snow. Driving on steep inclines and declines as well as crawling on high moguls were effortless. A ground clearance of 200mm is similar to its rivals and makes it ideal for Indian conditions too. The Tiguan is priced close to its rivals in Europe, the starting price in fact is slightly lower or on par with the Audi Q3, BMW X1 and the Mercedes-Benz GLA. The Tiguan has the features and engines to take on the competition. 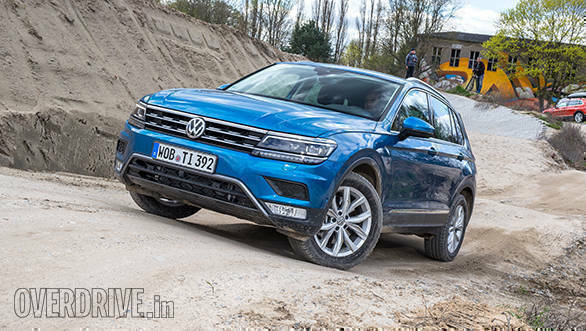 Volkwagen has launched the Tiguan in India at Rs 27.68 lakh.